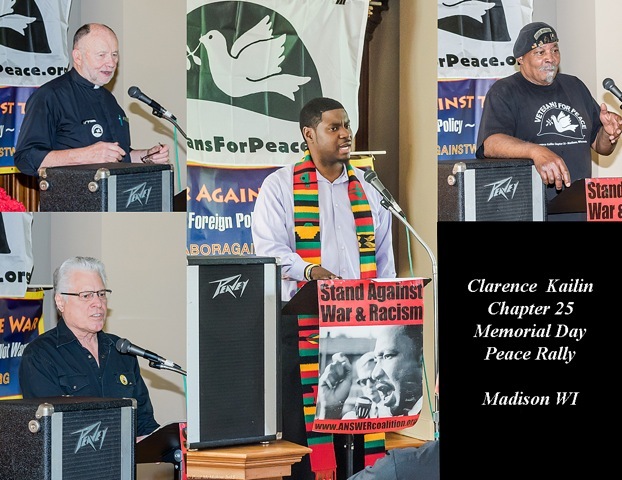 The historic Gates of Heaven building resounded with applause and affirmation during the annual peace rally sponsored May 25, Memorial Day, in Madison, by Clarence Kailin Chapter 25 Veterans for Peace. Four featured speakers delivered important and thoughtfully prepared comments, high school student scholarship winners were honored, and names of war casualties were read to live bagpipe music as the audience of 100 people received red carnations to be placed at the Lincoln Brigade monument at James Madison Park. The Gates of Heaven building, a former Jewish Synagogue, was moved to its present site at the park and served as a home for the peace rally. A somber display – The Memorial Mile – also was erected by Chapter 25 members on May 23, and was scheduled to remain in place along Atwood Avenue until May 30. The Memorial Mile consists of 6,675 symbolic grave markers, which stretch a saddening and impressive distance along the street to be viewed by thousands of motorists, cyclists and pedestrians. The peace rally began with a stirring set performed by the band Old Cool. Veterans for Peace member David Couper, an ex-Marine, and former Madison police chief and advocate of community policing, told the crowd: “Excessive militarism is dangerous in a free society…we have seen it manifested in our nation’s police. As soldiers, we fought an enemy, but police in a society such as ours must be our guardians, especially of those among us who are most vulnerable…” After Couper retired from his peace keeping work he was ordained a priest in the Episcopalian Church. His invocation was included in his thoughtful comments. Two of seven 2015 high school scholarship winners, Lyric Simonson and Jose Hernandez, read excerpts from their prizewinning essays titled: “Why I Believe War Is Not the Answer.” This year, Chapter 25 provided a total of $4,200 in scholarships to seven high school graduates. A record 39 students from seven high schools in Central and Southwestern Wisconsin wrote essays for the contest. Closing comments by Chapter 25 member and Vietnam War veteran Will Williams pointed out the injustices of war that he realized after serving in war. Williams emphasized the importance of educating and supporting young people in order to overcome traditions of militarism and violence. The peace rally ended with an invitation from the family of Clarence Kailin, namesake of Chapter 25 and a veteran of the Abraham Lincoln Brigade from Madison, to join in scattering some of Clarence’s ashes near the monument at the park. Norman Stockwell, of WORT-FM, offered the invitation on behalf of Clarence’s family, some of whom attended the peace rally. Names of Wisconsin residents killed in Iraq and Afghanistan, and those of civilian casualties were read. See more photos of the event here. Courtesy of Tom Glassel. This entry was posted in Clarence Kailin Chapter 25, Events and tagged Abraham Lincoln Brigade, Afghanistan, Clarence Kailin, David Giffey, David Newby, Everett Mitchell, Father David Couper, Gates of Heaven, Iraq, Madison, Memorial Day Events 2015, Paul McMahon, Phillip Fransen, scholarship, Veterans for Peace, Veterans for Peace Chapter 25, WIll WIlliams on May 26, 2015 by Website Administrator. Veterans For Peace, Clarence Kailin Chapter 25, Madison, WI, will be setting up the “Memorial Mile” display along Atwood Avenue in Olbrich Park again this year. We very much appreciate your past participation in setting the display, and would like to ask for your assistance again for this years’ Memorial Mile Display if your Memorial Day holiday weekend would allow time for it. The annual set-up time is scheduled for 9:00 am, Saturday, May 23. You may stop and start at any time. Hopefully, the ground will not be too dry and hard, and the installation will be accomplished in a few hours. We will have a tent set up with water, and possibly some snacks at the mid-point near the southern park entrance. The take down time is scheduled for 1:00 pm, Saturday, May 30. Please share this information to anyone that might be interested ! Noted speakers, music, high school scholarship awards, and poetry readings are scheduled for a Peace Rally Program beginning at 12:45 p.m. Monday, May 25, at James Madison Park, 614 E. Gorham Street. The program on Memorial Day afternoon is hosted by Veterans for Peace, Clarence Kailin Chapter 25. In addition to the May 25 program, Veterans for Peace (VFP) will sponsor a “Memorial Mile” display of more than 6,675 simulated grave markers to acknowledge U.S. deaths in the ongoing Iraq and Afghanistan wars. The Memorial Mile display, May 23 to May 30, will be located along Atwood Avenue east of Olbrich Botanical Gardens. David Newby, president emeritus of the Wisconsin State AFL-CIO, discussing efforts by U.S. Labor Against War (USLAW). David Couper, priest and former police chief – “Keeping the Peace” invocation. Will Williams, veteran and activist, with closing remarks. Warm-up music will be provided by the band Old Cool. A spoken word performance by UW-Madison’s First Wave is scheduled, as well as a poetry reading by Veterans for Peace member Daryl Sherman. Sean Michael Dargan will play a bagpipe tribute to end the program while names of war casualties are read. 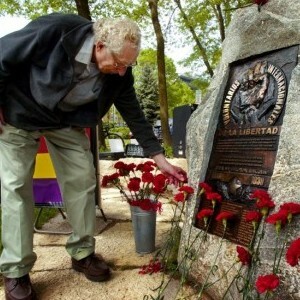 Audience members will be invited to place red carnations at the nearby Abraham Lincoln Brigade marker. Chapter 25 namesake and founding member, the late Clarence Kailin, was a volunteer fighting fascism with the International Brigade in 1937 during the Spanish Civil War. Program emcee is Chapter 25 member and Vietnam War veteran David Giffey. During the May 25 program, graduates from area high schools will be honored for their participation in the annual Veterans for Peace essay and scholarship competition named after the late VFP member Dr. James Allen. This year, 40 students at seven high schools from Madison to Baraboo to Boscobel wrote essays on the topic “Why I Believe War Is Not the Answer.” More than $4,000 in scholarships have been awarded annually by Chapter 25 since 2007. 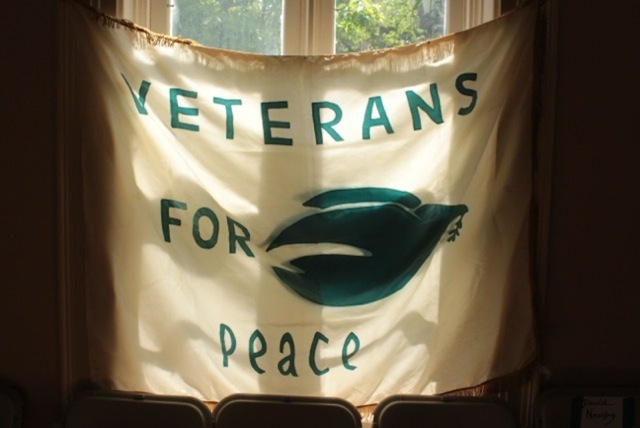 Veterans for Peace is a non-profit organization. All funds are raised through donations and small grants. The program is free and open to the public. Good will donations will be accepted during the program and at the Memorial Mile site. Chapter 25 member Steve Books will offer Veterans for Peace educational information. Audio assistance provided by Norm Stockwell and Steve Ringwood, WORT-FM Radio. 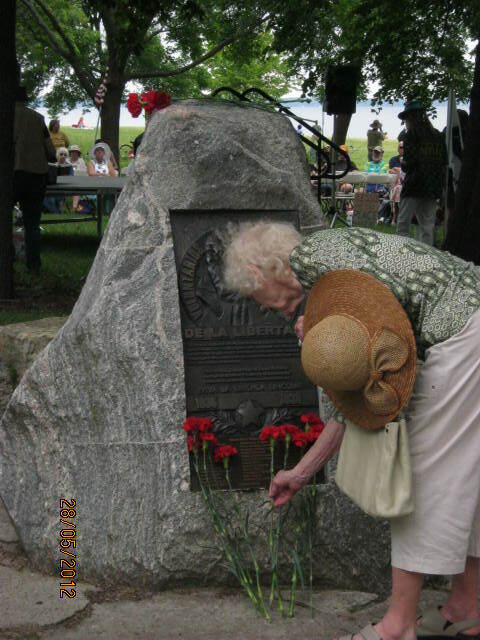 This entry was posted in Clarence Kailin Chapter 25, Memorial Mile, Veterans for Peace and tagged Daryl Sherman, David Couper, David Newby, Everett Mitchell, Memorial Day, Memorial Day Events 2015, Memorial Mile, Memorial Mile 2015, Old Cool, Peace Essay, scholarship, Sean Michael Dargan, Spanish Civil War, UW-Madison's First Wave, WIll WIlliams on May 5, 2015 by Website Administrator.